Queen of England 1553 to 1558. She was known as 'Bloody Mary' because of the number of people she had killed. 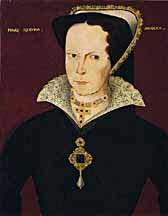 When Edward VI died and Lady Jane Grey was made queen, Mary and her supporters quickly took over and she was made queen. In 1554 she married Philip II of Spain who was heir to the Spanish throne. Mary did not have any children. She changed the country back to a Catholic one. Mary had all the leading Protestants like Thomas Cranmer put in prison. If people did not accept the Catholic Church they were punished as heretics. The punishment was death usually by burning at the stake. In 1555 Cranmer and 270 Protestant priests and other ordinary people were burned at the stake. Mary was an unpopular queen.